A car crashed into the home of an 88-year-old man early Wednesday -- marking the fifth time a vehicle has hit the house in Prince George's County. Leonard Miller was sleeping on a couch about 2 a.m. when he felt a crash nearby. A Honda had slammed into the front of the house on Cipriano Road in Lanham. 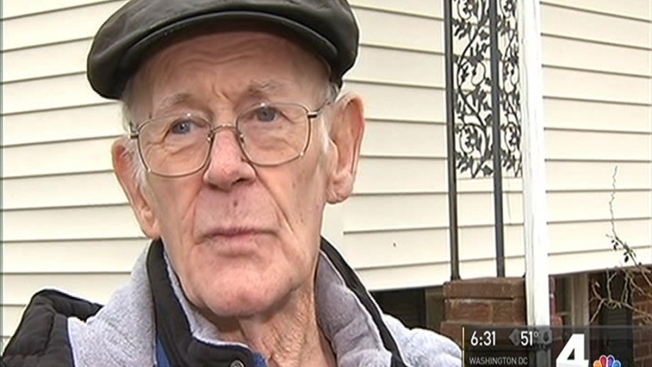 "When that car came in, I jumped up and said, 'Damn, another car hit my house,'" Miller said. He moved into the house in 1971. It's on a curve on a fast street, and drivers often lose control. The front of the house used to have wooden pillars, but a car crashed into them and snapped them. Miller then put in brick pillars. The crash Wednesday reduced some of those to rubble. Speaking with News4's Pat Collins, Miller had a sense of humor about the trouble. "What I'm going to do, Pat, is I'm going to get one of those signs, like a target, and I'm going to put it on my house," he said. The accomplished bowler -- who scored a perfect 300 once at age 75 and once at age 82 -- said he was not afraid when the car hit the house. "Why should I get scared? If I get scared, I might have a stroke or something. I'm not into that stroke business," he said. No charges had been filed against the driver as of Wednesday evening. A friend took the driver to a hospital after the crash.